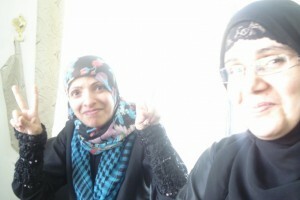 The first post in the EWAMT blog was about the “Ignorance of Blogging in Yemen” that was true in 2009 at the beginning of implementing EWAMT project” Empowerin Women Activists in Media techniques“. However, blogging now become more popular in Yemen. We won’t say it is because of our initiative, but also because of many other youths who spread these techniques. Some of these youth were trainees in one of our EWAMT session. Now I can say that who does not have a blog at least he\she knows what does it mean. Here, I will talk about our journey with EWAMT to spread the notion of blogging to 200 Young Yemeni ladies. Here, we are finalizing our Project with bride of what we have done as team, and with appreciation to Rising Voices for giving us the opportunity. We still remember our first training in 2oth May,2009, and how hard to organize the poster, Brochures, Coffee Breaks, folders with notes, looking for lap with cheap rent …etc. Always the first step is hard to make, but once we stepped we felt enthusiastic to finish our mission. Then we received many letters from local NGOs nominating their female employees to the blogging workshops. 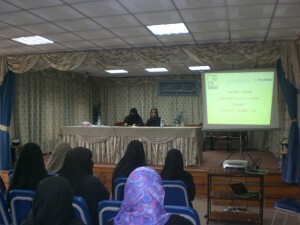 EWAMT conducted a workshop in Taiz city too in partnership with the National Culture Center for Youth. Taiz city is 225 km away from the capital, Sana’a. It is very known in Yemen as the Dreamer city, and it is the Yemeni revolution started there, so it is known now the revolutionary city. I participated in training organized by NDI in July, 2011 about “Good Citizen Journalistic Practices“. In this training we came out with the most important ethics that any citizen media activist or blogger should have it. I have transmitted this knowledge to my trainees later. Another fact from life that no success without obstacles or challenges. We went through many critical challenges that made us very frustrated. One of the most overwhelming obstacles was the electricity cutting, and slow speed on Internet connectivity. In addition, we could not rent another lab has a generator because it was too expensive for us. So we sticked to the lab we had rented before at the begining of the project from All Girls Society for Development, but because of the electricity problem we had to delayed part of our workshop so many times. The second challenge was for me as the runner of the project. We were implementing EWAMT project under the umberalla of Hand in Hand initiative. 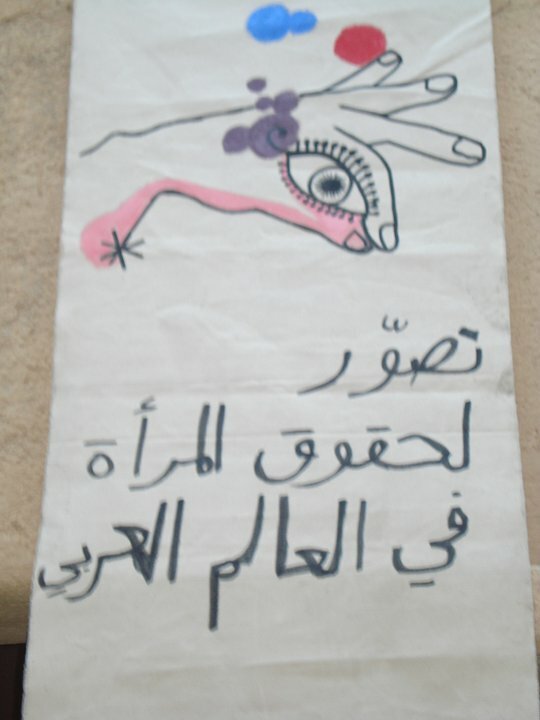 This initiative broke apart, and I founded another team and initiative called Kefiaia, which means in Arabic “Enough” . 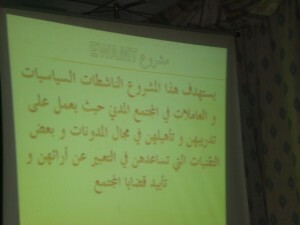 EWAMT workshops were not only about technical issues of blogging, but also were about exploring, discussing, and raising awareness about issues had being rarely talked about it in the public sphere because of the conservity of the Yemeni society, and sometimes because of the fear from the Yemeni intelligence would arrest anyone who expresses his\her discontent about the Yemeni regime. The Yemeni revolution started on February 2011, and it was not a surprise for us. Most of the people were enraged about the Yemeni government, and when Tunisia started the revolution series, it encouraged the Yemenis to break the silence and demonstrate peacefully. Most of the Yemenis are very well armed (Yemen’s weapons Culture), but they left their weapons at homes and went to demonstrate; approved to the whole world their pacifism. The revolution has two sides of effects. The Positive side that it heightened awareness among people politically and socially. Moreover, It gave us hope that one day we will see a new, developed Yemen.In the level of EWAMT project, many of women blogged about the revolution from their perspective. The negative side that a lot of people lost their jobs because many foreign organizations and companies left Yemen due to the continuous threating of the yemeni regime to drag the country into civil war. Furthermore, as kind of punishment the Yemeni government had cutted the electricity for 23 hours a day, so we had only one hour to charge our electronical devises, and do the essential work. In this situation it was almost impossible to finish training the last 20 ladies. The revolution lasted for more than 10 months and still going on. During all that time we severely suffered from shortage of electricity,water, and fuel. We stopped EWAMT workshops for many months, and then we got a solution how to finish our work under these hardships. We bought two additional batteries for laptobs, and two internet USP. Once a week I was training two women in my house by using the laptops and the internet USPs,or sometimes we went to cafes that have generators, and internet connectivity. Each week or sometimes each two weeks we train from two to three ladies. 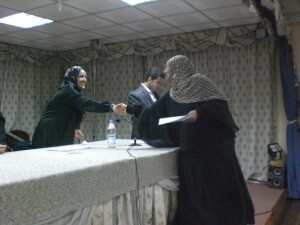 in this way we finished out ultimate goal to train 200 Yemeni ladies in blogging. It was difficult for us to complete the training for women in this deteriorating security situation, especially that the lab where we were using is located in the heart of Change square in Sana’a (Change square is the New University area, and it is named Change square by the Yemeni revolutionists who are demanding Ali Saleh, Yemen’s President, to step down). We have waited almost four months of the Revolution with a hope that the situation will calm down the situation, and resume the project. However, it seems that the clouds won’t be dispersed from the sky over Yemen. So we rented another lab in a Sapaia center, which located at the old university area, but before one week of the training, the Change square extended to the place where we should conduct our training sessions. For this reason, the center also was closed. We have not any solution but to conduct the sessions at a coffee shop. This video shows how the demonstrations expanded to force Ali Saleh to step down. On Saturday 14th May, we conducted a training only for three women in new media and the rest of the ladies will have the training in the upcoming weeks. For the first time we were training at a coffee shop. In fact, it was wonderful because we did not face the usual problems such as power outages in the presence of Coffee Trader’s generator. I will post pictures of the training soon. So far, we have trained 175, and we still need 25 ladies to reach our goal 200 new Yemeni female bloggers. The beauty of what is going on in Yemen is that the first time to see such an organize demonstration in Yemen. For instance, it is not allowed for the protestors to carry a weapon especially that most of the Yemenis are armed. They have medical camp, Media camp, and camp for discussions. In addition, They have put the strongest men and tribes on the first line of demonstrations next line is for the other youth, and women. It is difficult to uplowad these video becuase of the bad internet connectivity in Yemen especially these days. “Visualizing Wome’s Rights” This is the title of a workshop organized by Tachtical Tech http://www.tacticaltech.org in Jordan,Fenyan 5-8 Dec,2010. 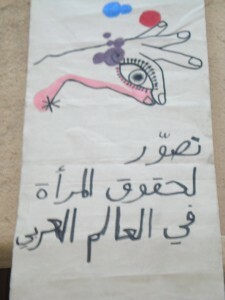 ﻿ The first time I knew about this workshop, I was wondering how women rights can be visualized. So Rising Voices and Tachtical Tech sponsored me to participate in the workshop. we all traveled by buses to Feynan from Amman to Feynan for about three hours. Then 20 minutes by Four Wheel Drive from the nearest road to the Pristine Dana Biosphere Reserve where Feynan Eco Lodge is located. The manager of the eco lodge told us that the eco lodge is one of the top fifty eco lodge in the world by National Geographic Adventure Magazine. There was no electricity or Internet connectivity, and we were spending the whole nights with the candles light only. The organizers divided us into three tracks, Information Design, Mappaing, and Animation. For me I was attending information design track. In the three days of information design, I learnt how to prepare the information in a way that can express its meaning to the audience by drawing, photographing, or using cartoons …etc. They showed us many examples around the world how people used the information they have, and made it more intersting for the audience. One of these examples that I liked most is ” Blank Noise” http://blog.blanknoise.org/ . By Blank Noise, women were able to send the pictures of their dresses that they were wearing in the streets when a man tried to harassed them. The idea of posting these pictures of dresses on the website is to raise public awarnes on the bad effecs of sexual harassment in the street on women. In addition, they gave us necessary tools that we can use it in collecting or designing the information, such as, Google Fusion, Many Eyes. In the last day, all the groups of other tracks and my group have gathered, and talked about what they did in mapping, animation, and information design. In brief, This workshop enhanced my abilities to use the information that I have to reach my cause. Moreover, I learnt from the experience of some of the participants in campaigning. Now I can say that I am ready to start working on my own campaign to stop sexual harassment in the streets. We still remember the first days the birth of EWAMT project in April 2008. The first steps of commencing the project was difficult. A new idea, faces, and female bloggers all these were the pillars of EWAMT. At the beginning, We wanted to have female Yemeni bloggers who can use the tools of using new media or social networks to defend for their causes. So far 147 ladies from EWAMT beneficiaries have the ability of using these tools. For the first time, one of EWAMT trainees, Sara Al-maktri, had proposed to be a new media trainer. So on Thussday 7th October, 2010 she had held a workshop for 12 ladies about social networking and new media. She was talking about new media to the trainees enthusiastically.Sara Al-maktari is one of the EWAMT success stories, and because of her initiation, she trained on this Thursday 12 ladies for EWAMT project. As we always say that EWAMT is like a candle lighting up the darkness of Yemen. Our first workshop in the second phase of the project was in Taiz city or it is called the Dreamer city. Taiz is one of the major cities in Yemen located at the southwestern highlands at an altitude of 1500 meters above sea level. 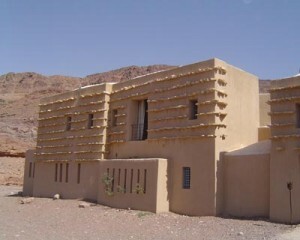 It is located at the foot hill of Saber Mountain. 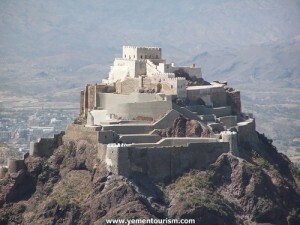 Saber Mountain is among the highest mountains in Yemen with an altitude of 3070 meters. One of the most famous castle is Alkaher Castle,and it is located on the foot of Saber Mountain. 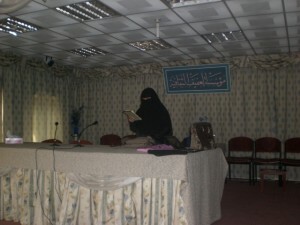 In Partnership with the National Culture Center for Youth, we trained 15 ladies on 31 March- April 1st 2010 in Taiz City. Most of the trainees were volunteers at the center, and the other were volunteers in HIV projects. It was the first time for them to hear about social networking term. In the first day we talked about the history of blogging, and they started to create accounts in blogger. In the next day, We continued the blogging. Then we discussed about google maping, Wiki, and Facebook. 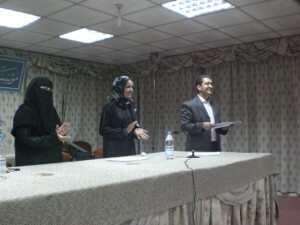 On wednesday 3 March,2010, we organized a small ceremony at Al-Afefe Foundation in Sana’a. We have started our program presenting hand in Hand Initiative’s activities .In addition, we talked about EWAMT project , and its sucess to come out at the end of the first phase with 24 active bloggers. Further more, we talked about a success story of one of the bloggers, that she got an invitation to participate in Women’s Leadership in Tehnology in Al-Sharja. However, she could not go there because her family won’t allow her to travel alone. Then, one of the bloggers came and talked about his experience in blogging. In addition,he explained how blogging changed his personality , and became a better person. At the end, We distributed the certificates, and the eyes of the new bloggers were shining. Thats True we have trained 112 ladies from NGOs and media, However 24 from them are active. It is still a good number to have 24 active bloggers.In the follwoing list are the 24 active blogs. 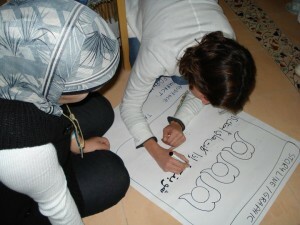 It was unexpected to train 20 ladies in the last workshop on 25 January,2010. We used to call for 20 and only 10 and sometimes 8 ladies who attend the training, but this time is something else. It was tiring day for the team. 1- High rate of literacy on Internet among women especially among members of political parties. 5-Lack of cooperation of some NGOs with us to nominate their female workers. In spite of these challenges, we all succeed to achieve our goal to train 100 ladies in the first phase, however we trained 112. During February we are going to arrange for a ceremony to distribute certificates only for active bloggers, and issue the first edition of Tadween Magazine. 3- Issue the second edition of Tadween magazine. 4- Make two workshops in two other governorates. Empowerment of Yemeni Women Activists in New Media Techniques is proudly powered by WordPress MU running on Rising Voices. Create a new blog and join in the fun!